In the past two weeks, 39 terrorist attacks have occurred in North Sinai. In the resulting clashes between armed groups and security forces, 52 gunmen and civilians and six security personnel have died. Tensions have also flared at the illegal smuggling tunnels on the border with Gaza, with one Central Security conscript killed by smugglers on Thursday. Monday witnessed the highest civilian causalities, when a bus transporting workers to the army-operated Al-Arish Cement Company was attacked. Five were killed – including one child – and 15 were wounded. Friday’s attacks resulted in some of the most intense army engagement, concentrated at Al-Masa'id, Al-Joura, and the Central Security camp at Al-Ahrash. The frequency of attacks has varied from two to five in a single day. In addition, targets have expanded from fixed security checkpoints to mobile patrols. In most operations, the gunmen use four-wheel drive vehicles and combinations of light and heavy weaponry. However, in three recent attacks RPG-7 launchers were used, most likely smuggled from Libya. The G-7 grenade is capable of penetrating armoured vehicles and is generally fired at the doors. The operations have been largely confined to the 40-kilometre area between Al-Arish and Sheikh Zuweid, extending northward toward Rafah along the border with Israel and up to the Karam Abu Salem crossing. Northern Sinai residents have grown accustomed to the sounds of gunfire at night, when fighting intensifies between the gunmen and the joint army-police forces. Eyewitnesses tell Ahram Online that while they are familiar with gun-use in the Sinai, the current crisis is unique in that there are foreigners involved, changing the rules of the game. Many local residents are alarmed. Mohamed Hamad from Al-Arish tells Ahram Online that he felt compelled to take his family and return to their native home of Beir Al-Abd, some 80 kilometres from the city, because of the climate of terror the gunmen have created at night, even in areas without security installations. Hamad added that military aircraft frequently flies at low altitudes near residential areas, an unfamiliar experience for inhabitants of urban areas such as Al-Arish. Sinai political forces confirm that the recent violence is linked to the military's removal of former president Mohamed Morsi. They say that even militants who oppose the Muslim Brotherhood – the group from which Morsi hails – have begun to take heed of fatwas calling on them to defend what is portrayed as an assault against the Islamist project. With that, some 22 politically-diverse groups have joined forces, and together they are believed to have around 12,000 fighters working in small units to carry out the operations. According to sources monitoring military performance in the Sinai, security breaches have been less than anticipated in areas such as Al-Hilal mountain, although there are special forces backed by Apache fighters equipped for missions in the mountainous terrain. Rather, confrontations are largely taking place in open fronts at the olive fields near Al-Arish and in Al-Sot. A Muslim Brotherhood source speaking to Ahram Online accused the army of fabricating attacks in order to label the Brotherhood "terrorists." According to the source, who was responsible for Sinai issues under the former president, "The attack against the workers bus was the result of a missile shot from either an Egyptian or an Israeli plane." The source went on to detail an alleged army plan to re-install Mohamed Dahlan, a former Fatah leader and Hamas-opponent, in Gaza. According to the source, the Brotherhood in Gaza opposed this plan, and "this is what prompted the army to fabricate imaginary operations in order to shut down and control the tunnels." The source, who spoke on the condition of anonymity, refused to comment on the relationship between the Muslim Brotherhood and the Sinai jihadist groups. That a strong relationship exists is taken for granted among residents. As Sinai activist Musad Abu Fajr puts it, "There is a high level of open coordination between the two sides. This is no longer a secret to anyone in the Sinai." Ahram Online spoke to several tribal leaders in the Sinai. A number of leaders from Sheikh Zuwaid are reluctant to declare a position on recent developments. Nevertheless, a prominent elder said he was on good terms with jihadist leaders and that prior to 30 June, these groups had refused to take up arms against the army. He added that some jihadist leaders who had previously refrained from entering politics have now begun to issue fatwas, and with that new groups have emerged such as "The Legitimacy Brigades" or "The Legitimacy and Victory Brigade." He added that these groups act independently of the tribes. At the same time, the tribal source stressed that the situation was worse than that portrayed by the media. People in the Sinai are especially worried about "alien elements" who hail from "jihadist" fighting fronts in North Africa, and the "Asian" Al-Qaeda who continues to enter Sinai despite tightened security. Hossam El-Shorbagi, the son of a leading Muslim Brotherhood figure in the Sinai, said that "Tribal leaders are worried by elements who they regard as a threat to themselves, especially now that even tribal authority has lost its prestige." A former intelligence source familiar with the Sinai said the problem is exacerbated because "the relationship between the tribes and the police is still poor." "I believe some parties want to generate a huge battle in the Sinai in order to sap the army’s strength," El-Shorbagi added. To this, the intelligence source countered "We should not say that everything is under control. However, I am certain that we have a high combat efficacy among army units trained for such confrontations ... These new units will play a major role in the coming round. However, because of severe intelligence shortages on the ground, the task will be longer and may evolve into an anti-terrorism programme." Two army squadrons have crossed Salam Bridge over the Suez Canal en route to the Sinai. 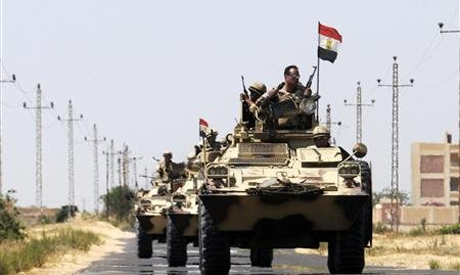 Sinai army sources report that military operations will expand in the coming days. A highly-ranked military source said that reports of the Egyptian army asking Israel for permission to reinforce troops have been taken out of context. According to the source, there is a certain level of coordination, including intelligence exchange, to which both sides are committed due to their shared borders. He also emphasised that security coordination is common on the international level to address anti-terrorism efforts. Nevertheless, the source suggested that Israel has been unhappy with the increase in troops in North Sinai following the kidnapping of Egyptian soldiers in May. Cairo ignored Israeli complaints at the time in the name of national security. However, an armed attack at Kidsh Barnie, on the border with Israel, on Sunday has since emphasised the need for increased troop presence. On Sunday, an Israeli unmanned Hermes-450 aircraft crashed near the Israeli-Egypt border. According to the military observer, the aircraft was presumed to be on mission in Egyptian airspace, highlighting Israel’s close watch on Egyptian military action in the Sinai. "I am very worried about the [reaction] from that direction. But we are confident and able to handle such challenges," the military observer added.